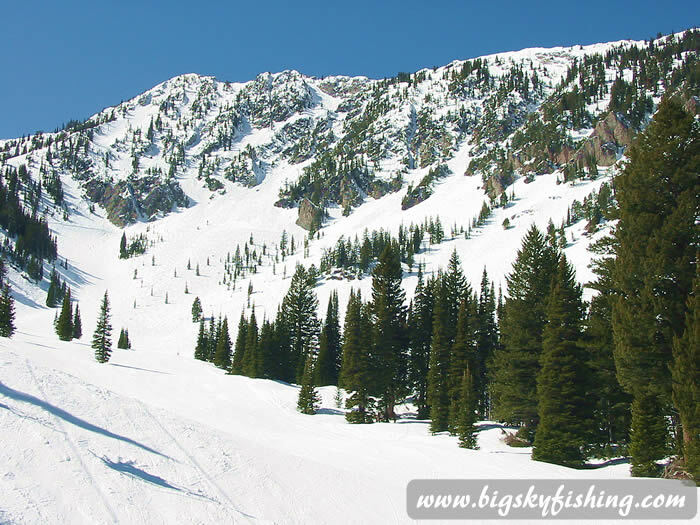 Bridger Bowl is an awesome ski area located just outside Bozeman, Montana. Bridger Bowl has some of the finest downhill skiing in Montana, at affordable prices. Bridger Bowl, like most other ski areas in Montana, is a ski area—not a resort. There is no slope side lodging, gourmet restaurants or exotic shopping opportunities. 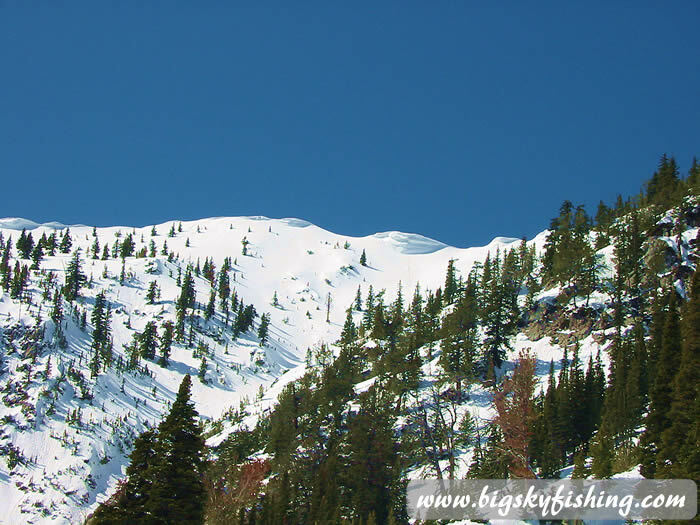 Instead, Bridger Bowl is a non-profit ski area which offers some of the finest terrain and snow conditions in Montana. Being a non-profit corporation, all profits are put back into ski area at year’s end, either in the form of keeping lift ticket prices low or through on-mountain improvements. Getting to Bridger Bowl is simple. Indeed, it may be the easiest and most accessible ski area in Montana. 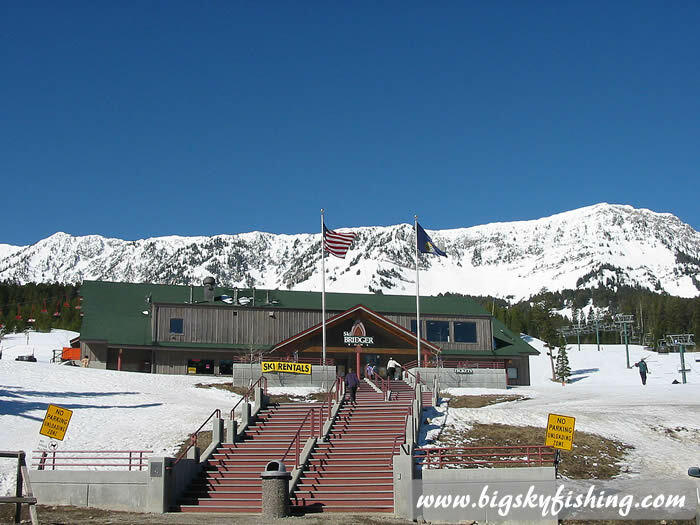 Bridger Bowl is located just a 16 mile drive from downtown Bozeman, on well-paved Highway 86. Unlike many ski access roads, this highway does not excessively twist, turn, have switchbacks or have steep gradients. In good weather, the trip from Bozeman to the parking lot of Bridger Bowl can be done in about 20 minutes. A shuttle also provides a ride to the ski area from various spots in Bozeman, too, making the mountain accessible to visitors who arrive without vehicles. Bridger Bowl has a respectable lift-served vertical of 2600 feet. Additional vertical is obtained by trekking from the top of the Bridger Chair to what is known as "The Ridge." Only expert and advanced skiers need make the journey up to the Ridge, since only true double-diamond terrain will be found –with no easy way to get back down. The mountain receives significant snow, with an average of 350 inches of snow each year. Owing to the ski areas location, much of the snow is light and powdery, not wet Sierra Cement. 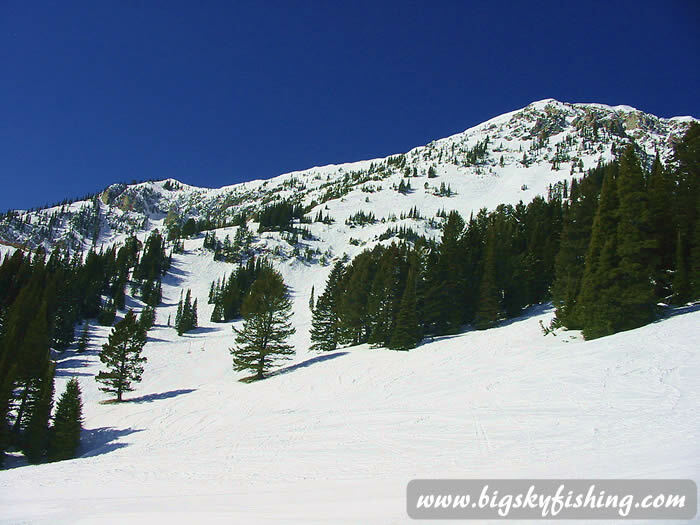 Bridger Bowl, in comparison to many other Montana ski areas, tends to have nice weather. Since Bridger is located far from the continental divide, sunny days are common. Bridger Bowl is essentially two large bowls (the North Bowl and the South Bowl) that merge into one flat area towards the bottom of the mountain. The two bowls themselves are divided by the Bridger chairlift, which runs up the ridge that separates the two bowls. To reach these big and beautiful bowls from the base area, the trip begins by riding one of two chairlifts from the base area that lead to the top of the “flat part” of the mountain—and the top of most beginner terrain at the mountain. From here, skiers can access any of the five lifts that provide access to all the skiing on the upper mountain. The skiing in the North Bowl consists of one large bowl, which consists primarily of expert terrain, while intermediate trails are located on the northern flank of the bowl. Intermediate Terrain in the "North Bowl"
The top of the lift served portion of the North Bowl is quite steep. Most of the skiing in the North Bowl that is accessed from the Bridger Lift is rated for expert skiers. None of the trails, except for one cat trail (North Bowl Road), are groomed. The lack of grooming combined with the steep slope limits intermediate skiing possibilities to just a couple of trails accessed right next to the Powder Park Lift, but makes for wonderful expert skiing. There are no ski trails for beginners in the North Bowl, either. Beginner and intermediate skiers, however, will find excellent trails on the northern flanks of the North Bowl. Intermediates will want to use either the Powder Park Lift or the Alpine Lift to access this terrain. The trails accessed from these two lifts have excellent variety. Some trails are well-groomed, while others remain bumped up but without the steep pitch found on more advanced trails. The more adventurous can also take advantage of the fun, but fairly short, glade skiing areas that cut through the trees but on slopes that aren’t too steep. These trails, called Crazy Woman, Elk Run, Good Clean Fun and Cross Cut, are located on the far north end. One word of caution, however, is that from the bottom of these intermediate glade trails, a long and boring cruise all the way to the base area is needed to pick up a chair. Terrain in the "South Bowl"
The South Bowl at Bridger Bowl ski area consists of some absolutely wonderful lift-served ski terrain for both intermediates and experts. Two lifts serve the terrain in the South Bowl, the Bridger Triple Lift and the Pierre’s Knob Triple Lift. Most expert skiing in the South Bowl is accessed from the Bridger Triple, which has a mid-station. Experts will want to take the lift to the top. To ski the expert trails in the South Bowl from the top of the Bridger Chair, stay to the south of the lift (left). The terrain consists of a mix of chutes, open terrain and glades—all on very steep slopes with a vertical rise of 1300 vertical feet. Some intermediate trails are also accessed from the Bridger Lift. To ski these trails, without having to negotiate down through steep mogul fields, intermediates will want to get off the Bridger Lift at the midway station. Note that there are no intermediate trails from the top of the Bridger Lift other than kind of a boring but scenic cat trail that leads to the North Bowl. Instead, most intermediate trails in the South Bowl are accessed off the Pierre’s Knob Triple Chair. The trails in this part of the South Bowl are wide, well-groomed and provide a great variety of intermediate skiing. More adventurous intermediate skiers can also venture into the trees for a taste of glade skiing without the steep gradient found elsewhere at Bridger Bowl. There are some expert trails accessed of the Pierre’s Knob Lift, too. These trails, however, tend to be quite short in comparison to the other expert trails at Bridger. Moreover, some of these trails will require a long, flat run-off to get back to the lift. The Ridge is accessed by taking the Bridger Chair to the top and then hiking the remaining 600 vertical feet to the top of the mountain. Once on top of the mountain, skiers can then make their way along the top of the ridge, dropping down into the North Bowl or South Bowl, through a dizzying variety of advanced skiing terrain. “The Ridge” at Bridger Bowl is true advanced level skiing in every sense of the word. The slopes are very steep and getting down requires skiing through either long, narrow chutes or through thickly wooded terrain filled with rocks. Moreover, once on top of the “Ridge,” there are no easy routes down. Looking Up at "The Ridge"
For advanced level skiers, the “Ridge” provides some of the finest advanced skiing in Montana , comparing favorably to the advanced skiing on Lone Peak at Big Sky Resort. Yet, unlike at Big Sky Resort, none of the terrain is lift-served , as it requires hiking up to the “Ridge” and then traversing down the ridge to access such famous places as “The Nose” and “Bridger Gully,” among others. For this reason, Bridger Bowl requires anyone who plans to ski from the “Ridge” have a partner, an avalanche receiver, be an advanced skier/snowboarder and have good knowledge of the terrain. One look at the terrain from below makes the reason for these restrictions obvious. Huge blocks of snow overhang the top of the “Ridge,” meaning that avalanches can and do happen, despite the best efforts of the ski area to reduce their number. Moreover, the terrain off the “Ridge” is not patrolled. Having a partner can literally mean the difference between life and death should something nasty happen on the way down, like hitting a rock, taking a 500 yard tumble through the trees, or worse. Above all, having a good knowledge of the terrain is essential. While there are many ways down from the top of the “Ridge”, there are also many ways to get stranded at the top of some terrain that is either closed or isn’t skiable due to rocks, trees, cliffs, a lack of snow, extreme steepness or all of the above. And because the terrain is so steep, getting “stuck” means being between a rock and a hard place, since hiking back to the top of the mountain isn’t a viable option in some areas. Overall, Bridger Bowl is a wonderful ski area located on a beautiful mountain just a short hop from one of Montana’s prettiest towns. Lift tickets are affordable, the terrain at Bridger Bowl is incredible and the snow piles up high and deep allowing for a substantial snowpack most years. Skiers of all abilities will never get bored during a day, or more, of skiing at Bridger Bowl. Terrain : 20% Beginner, 30% intermediate, 50% advanced/expert.